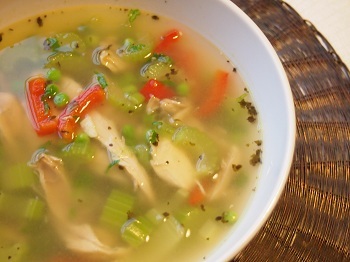 This chicken vegetable soup recipe is very healthy and nutritious. 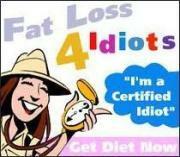 It is full of vitamin A, vitamin C and niacin. 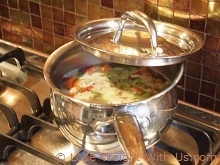 The recipe can be cooked in two ways: Method #1 for a quick and easy chicken soup, if you already have some cooked chicken leftovers. In method #2 we are going to cook raw chicken. It takes longer, but we are going to have yummy homemade chicken broth at the end. This chicken vegetable soup recipe contains only 133 calories, 5g of net carb per serving, therefore it is suitable for a low calorie, low carb high protein diet. Recipe Nutritional Profile: Diabetes Appropriate, Healthy Weight, Heart Healthy, High Protein, Low Calorie, Low Carbs, Low Cholesterol, Low GI, Low Fat, Low Sodium, Gluten Free, Dairy Free, Good Source of Vitamin A, Vitamin C and Niacin. Preparation time: 10 min for both methods. Pour ready made broth into a medium pan with celery, pepper, oregano, thyme and garlic, then bring it the boil on a high heat, cover with a lid, reduce the heat to medium and simmer for 10 min. 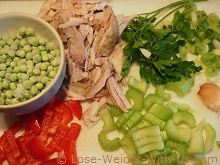 Throw the cooked chicken, peas, and spring onion into the pan and continue cooking for 5 min. Serve it hot, garnished with parsley. Wash a chicken leg in cold water and place it together with celery, onion, oregano, thyme and salt into a large pan, pour in 1.5 litres of water and cover it with a lid. Bring it to the boil on a high heat, then reduce the heat and simmer for 40 min or until the chicken is cooked. Remove the chicken from the pan and strain the broth, throw way the onion and save the celery for later. Return the broth into the pan and boil it on a high heat for 10 min trying to reduce until about 600 ml left. At the same time, remove the skin and bone from the leg and tear the meat into long chunks. Once the broth has reduced, put the chicken and celery back into the pan with the pepper and peas, continue simmering for 5 min. Serve the soup hot in a warm bowl, garnished with parsley.